Mamata’s West Bengal will forget the acrimony of the Presidential polls and now the grand occasion of felicitation will occur for honouring the President in West Bengal with a civic reception in the next month probably on September 14. Mamata Banerjee’s facebook appeals are still not deleted and they screamed her support for the former President A.P. J. Abdul Kalam. The dramatic u-turn occurred when she dramatically extended her support to Pranab Mukherjee. Now Pranab Mukherjee is the 13th President of India. He is the first Bengali to achieve this honour. It has been a long hiatus, during which the house on Raisina Hill has been occupied by a missile man (APJ Abdul Kalam), a former diplomat (K R Narayanan) and a low-key career politician (Pratibha Patil). Earlier Presidents who came from the Congress, such as R Venkataraman and V V Giri, held office in the days of single-party rule. But the presidency of Pranab Mukherjee comes in the era of coalitions. Today’s friend is tomorrow’s foe, and yesterday’s foe is today’s friend. The Coalgate scam shakes the UPA . The NDA looks a shattered house in spite of its thunderous shouting against the government in power. Its own allies are not united in the fight and it tried to rope in Mamata in its fight against corruption. But Mamata has a different game plan. The Coalgate scam gives an unexpected chance to Mamata to fish in dirty water. Actually it was Pranab's political skills plus his remarkable knowledge of parliamentary affairs and economic issues that motivated the UPA to choose him as their presidential candidate. Now he is the President of India. On several occasions, he won over recalcitrant allies and also convinced the opposition parties to toe the government line whenever a consensus was needed in the national interest. Congress is facing a big dilemma as the coalgate scam BJP's attempts to rope in Trinamool Congress in its attack against the government over the CAG report on coal blocks allocation have failed with TMC chief Mamata Banerjee rejecting the move. In its campaign of seeking Prime Minister Manmohan Singh's resignation on the coal blocks issue, BJP is understood to have appealed to the TMC to join its fight. Mamata has not agreed to increase distance with the UPA in spite of its opposition to FDI. The BJP in spite the support of social activists like Anna Hazare and religious guru like Ramdev in their crusade against corruption appears to be a house in disarray. The Parliamment has become a house of the opportunists. With two years being left for the completion of the present Loksabha tenure, the BJP MPs will also not be ready to resign for creating pressure on Congress. It is a very uncomfortable decision even for the allies of the NDA. Under the circumstance, Mamata Banerjee is no fool to go for catching ten birds in the bush leaving the sure shot in her hand. 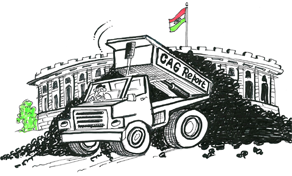 Three key CAG reports were tabled in Parliament on indicting the government of causing a combined loss of crores of rupees to the national exchequer. The much-awaited CAG report on coal block allotment said private firms are likely to gain Rs.1.86 lakh crore from coal blocks that were allocated to them on nomination basis instead of competitive bidding. Coming on the heels of the Commonwealth Games scam, the 2G spectrum issue, power and airport scams, “Coalgate” has clearly hobbled the UPA government, making its continuance in power untenable. Everybody expected that Mamata who is so vocal on FDI, would not have spared the Coalgate scam. But she is now keen on getting the moratorium and special economic package for West Bengal including the exemption of interest on the loans. So she now gets closer to the corruption tinted UPA, and chooses not to oppose it for getting more mileage.